The ISO 9001:2015 standard specifies requirements for establishment, implementation, maintenance and continual improvement of a Quality Management System. The expert ISO 9001 consultants in India (QMS consultants in India) of the Inzinc Consulting India Team will ensure in providing professional consultancy solutions that puts a solid QMS foundation. ISO has released the latest edition of the Quality Management Standard - ISO 9001- which is the ISO 9001:2015. This new version replaces the previous version - ISO 9001:2008 standard from 15th September 2015. Please read this page to find out the changes in the new ISO 9001:2015 standard and the advantages of this new ISO 9001 version. Our ISO 9001 Consulting team can help Organizations in smooth and effective transition from ISO 9001:2008 to ISO 9001:2015 (ISO 9001 version 2015). What do you mean by QMS or Quality Management System? A quality management system (QMS) is defined as "an integrated system of various business processes aimed at the achievement of quality policy and quality objectives to meet customer requirements and achieve Customer satisfaction". resources that are necessary to implement quality management. Our expert ISO 9001 Consultants in India ensures that the above Seven Quality Management Principles are well understood by organizations to help them effectively implement a Quality Management System. ﻿Increased trust with your customers and stakeholders. In today’s world, change is the only constant. ISO standards are not an exception either. The ISO has recognized the need to keep standards up-to-date to help stay relevant to the modern technology, concepts and practices prevalent in the marketplace and keep pace with the changes in the global economy. To guide organizations in adapting to the growing customer needs, the ISO 9001 has undergone revision from the 2008 version to the 2015 version which was published in September 2015. What are the key changes to find in the new ISO 9001:2015 standard? 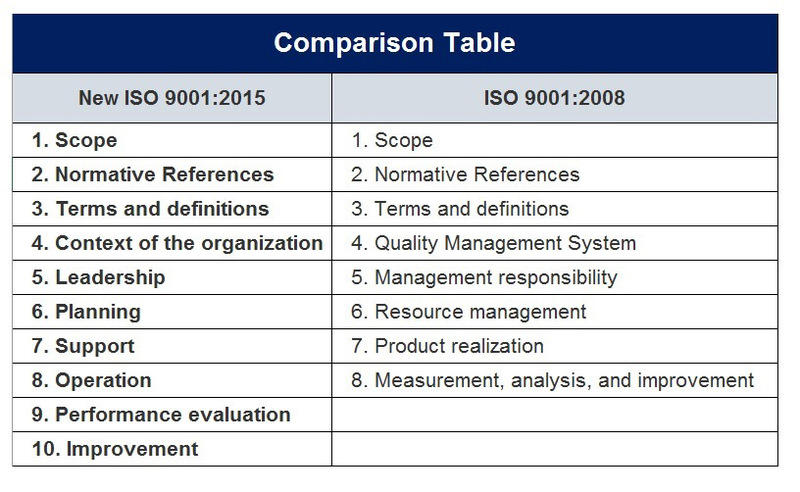 The new ISO 9001 version has a common higher level structure and text with the intent to make integration with other management system standards easier. The new version gives more importance to risk.The new versionemphasizes on a risk-based approach. Risk will be integral to the entire quality management system. Preventive action from ISO 9001:2008 has been replaced by risk management and planning. ISO 9001 Documentation: The requirements of the new version are less prescriptive. For instance, instead of the explicit need for traditional documentation like a quality manual, it suggests for a more flexible documented information. However, this will not imply that organizations who currently have a quality manual need to change or discard. It is only that the flexibility of documentation is increased,where relevant information can be retained and can be made available when needed. This makes it more flexible for service-related organizations. The new concept of Context of the Organization requires that the organization while determining its environment should not only consider customers, employees and suppliers, but also those who get affected by their operations for instance the communities in which they operate or may have significant influence. Our ISO 9001 Consultants in India will explain the correspondence between ISO 9001:2008 and ISO 9001:2015 in case where organizations want to undergo transition to the new ISO 9001 version. Leadership: The new standard talks about a vital clause called Leadership. This enables greater involvement of the leadership team into the implementation of the quality management system which in turn ensures that the entire organization is motivated in the achievement of the organizational goals and objectives. Risk based approach & identification of Opportunities: With the introduction of the risk based approach to the management system, it helpsin the identification of business opportunities that has a positive effect on the bottom line. Integrated Methodology: The new structural changes applicable enables easier integration of this quality management standard with other standards thus leading to effective integrated management systems. What to do for Organizations already certified to ISO 9001:2008? Organisations are granted a transition period after the revision has been published to migrate their quality management system to the new version of the ISO 9001 standard. Our ISO 9001 Consultants in India value-added consultancy services that enables smooth and effective transition from ISO 9001:2008 to the new ISO 9001:2015 standard. Are you already certified to ISO 9001:2008 and would like to transit to ISO 9001:2015 standard? Our Expert ISO 9001 Consultants in India will ensure a smooth transition from the earlier ISO 9001:2008 standard to the new ISO 9001:2015 standard by providing you a transition plan and ensuring the transition is complete in a timely and result-oriented way. The ISO 9001 Transition involves developing an ISO 9001 Transition Plan, provide guidance for transition, provide ISO 9001 Transition training, ISO 9001 Transition documentation work and implementation checks to ensure minimum ISO 9001 Transition period. Inzinc is one of the preferred ISO 9001 Consultants in Bangalore, Chennai, Mumbai, Delhi, Pune, Ahmedabad, Coimbatore, Hyderabad, Jaipur, Kolkata, Mysore, Surat, Shimoga, Belgaum, Tumkur, Hubli, Dharwad, Mangalore, Udupi, Bellary and other cities in India.